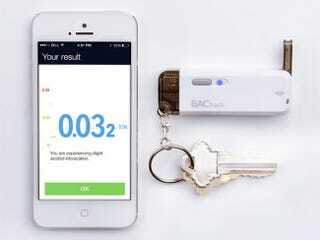 Breathalyzers... they're one of the few devices that's both lots of fun and totally practical. BACtrack makes some of the best. Now, Giz readers can get an exclusive discount on BACtrack's bluetooth enabled Vio (great for the holidays). Use the code "viogiz" for an extra discount, taking the price down to $39.99. A breathalyzer is a smart purchase with the holiday season coming up. Plus, with the BACtrack app, you can not only track how intoxicated you are, but you can also get estimates on when you will return to 0.00% blood alcohol content. >> Get 20% Off The BACtrack Vio – $39.99 with code "viogiz"